Current: Magic bears and cops with robot arms abound in GOD HATES ASTRONAUTS, need we say more? 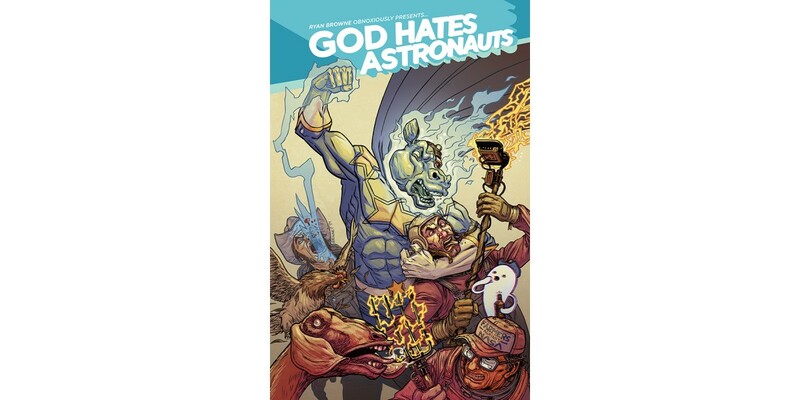 First announced at the C2E2 conference, Ryan Browne’s (THE MANHATTAN PROJECTS, BEDLAM) farcical cult-sensation GOD HATES ASTRONAUTS returns with a new story this September from Image Comics. "Jumping from weekly web-comic to large scale epic adventure has been extremely challenging and rewarding,” said Browne of his transition from webcomic to Kickstarter project to an ongoing print series with Image Comics. “It was very important to make God Hates Astronauts #1 a perfect jumping on point for new readers, while having enough allusions and references to the old material for the series' die hard fans. I hope you guys like astronaut farmers with laser pitchforks, space crab armadas, and three-dimensional cowboy narrators! Rest assured, it will all make sense yet be as stupidly-ridiculous as the law will allow!" The first issue of GOD HATES ASTRONAUTS arrives in stores 9/3 and will be available for $3.50. It can be pre-ordered using Diamond Code JUL140440. There will also be a variant cover featuring art by Geof Darrow available to pre-order with Diamond Code JUL140441.